The knowledge of ecological role as well as economical importance of specialized insect communities associated with plant seeds is of great significance. Therefore, it is surprising how little information is available on taxonomy and ecology of pre-dispersal seed predator communities of a given biogeographic region. The first complex study in Europe has been started at the Department of Zoology of the Plant Protection Institute of the HAS in the 1980s. The systematic investigation of the pre-dispersal seed predators inhabiting the Leguminosae species in Hungary has been conducted with the collaboration of scientists from the Hungarian Natural History Museum, as well as from departments of animaland plant systematics of the Loránd Eötvös University, Budapest. The results obtained so far (see reference list) prove that the extension of such investigations to the entire Carpathian Basin could provide further valuable information and results on animal and plant taxonomy, community ecology and evolution of insect-plant relationships. The results would substantially contribute to biodiversity research and would reveal yet unknown details of relationships between wild and grown plant species mediated by pre-dispersal seed predators. The process of global warming can enhance the appearance of new invasive species in the Carpathian Basin. The planned investigation could result also in early signalling the occurrence of such species. Plants. The reliable identification of plant species (subspecies, varieties) is the fundamental condition for obtaining sound results. In order to diminish doubtful cases voucher specimens are available in herbaria. Data gathering is carried out by the regular collection of ripe and ripening fruits/pods of wild and grown plant species, with special regard to less known species (subspecies, varieties) and less explored areas of the Carpathian Basin. Pre-dispersal seed predator species. 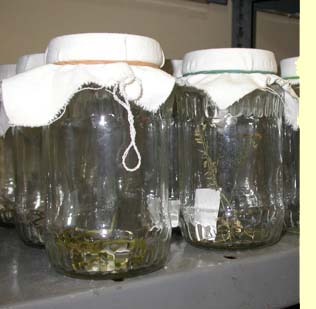 In order to rear seed predators and associated zoophagous species from fruits/pods, plant samples are kept in well-ventilated, however, properly closed containers. These are checked from time to time, and all emerging insects are removed for further investigation. Taxonomy, phylogeny. Biochemical methods will be used for species identification and for molecular phylogeny studies on plants and pre-dispersal seed predators. Impact of pre-dispersal seed predators on seed crop. The importance of seed predators in decreasing plant fitness are assessed from the level of damage exerted on seed crop. To accomplish this, a detailed examination of fruit and seeds for the presence of seed predators is executed. Szentesi, Á. & Jermy, T. (1995): Predispersal seed predation in leguminous species: seed morphology and bruchid distribution. Oikos, 73: 23-32. Szentesi, Á., Jermy, T. & Takács, V. (1996): Niche relations in Vicia-inhabiting Bruchus spp. Entomol. Exp. Appl., 80: 152-155. Szentesi Á. & Jermy T. (1998): Leguminosae-fajokon élõ magfogyasztó rovar-guildek: közösségszerkezet és kölcsönhatások. In: Fekete, G. (szerk. ): A közösségi ökológia frontvonalai. Scientia, Budapest, 105-113. Podlussány, A., Jermy, T. & Szentesi, Á. (2001): On the leguminous host plants of seed predator weevils (Coleoptera: Apionidae, Curculionidae) in Hungary. Acta Zool. Hung., 47: 285-299. Jermy T. & Szentesi Á. (2002): A tonkini óriás-zsizsik [Megabruchidius tonkineus (Pic, 1904)] felbukkanása hazánkban. Növényvédelem, 38: 346-348. Jermy, T., Szentesi, Á. & Anton, K.-W. (2002): Megabruchidius tonkineus (Pic, 1904) (Coleoptera: Bruchidae) first found in Hungary. Folia Entomol. Hung., 63: 49-51. Jermy, T. & Szentesi, A. (2003): Evolutionary aspects of host plant specialisation -- a study on bruchids (Coleoptera: Bruchidae). Oikos, 101: 196-204. Szentesi, Á., Schmera, D. & Jermy,T. (2006): Spatial and temporal organisation of the pre-dispersal seed predator guild in a perennial legume, Vicia tenuifolia. Ecol. Entomol., 31: 114-122. György, Z (2007): To the biology of the honey locust seed beetle, Megabruchidius tonkineus (Pic, 1904) (Coleoptera: Chrysomelidae: Bruchinae) – Folia Entomologica Hungarica 68: 89–96.